In today’s western society, almost every individual owns a piece of technology. Be that a mobile phone, a tablet or a computer; technology has become so integrated into our lives that we use it daily to complete simple tasks such as communicating, banking and even shopping. The more we depend on technology, the more criminals will try to exploit this dependency to steal our private information for gain. As technology advances and our cyber security measures improve, so too do the methods employed by these so-called ‘hackers’ to breech our defences and exploit the weaknesses in our systems. Although this may seem like a very modern issue, hacking has actually been around for billions of years. Computer coding. Photo by Joffi, Source: Pixabay. What’s going on with YouTube and small creators? I embarked on my own YouTube journey some two years ago. To say it’s been a frustrating and agonising ride could be rightly called an understatement. Video production has presented me with a massively steep learning curve. I know full well I haven’t come anywhere near perfecting my craft, but it’s one of those labour of love things. Which is one of the reasons I still do it. Initially I started the channel with an interest in talking about general science topics. As time went on I realised that in all realism this wasn’t working for me. The subscriber count is still tiny, and the lifetime views number in the very low thousands. This is all part and parcel of finding my feet. Again, this is all part of that learning curve. Since “rebranding” the channel a few months ago I feel I’ve gained a new perspective on the whole affair. In that time the monolithic behemoth that is YouTube (Google) has made it fairly clear that small channels aren’t worth their time. A sense of malaise has set in among small channels and I have to admit it’s hard to fight off sometimes. Zero prospects for monetisation at this point. Well technically not zero, but a statistically insignificant chance of a small channel getting through the ever shifting goal posts YouTube places before us. I don’t begrudge larger channels their success. It is hard work, I’ve learnt that much. They obviously have done the hard yards. We little guys generally know this is the path we must take too. But sometimes an uphill battle becomes something else, and you need to find another reason to continue. 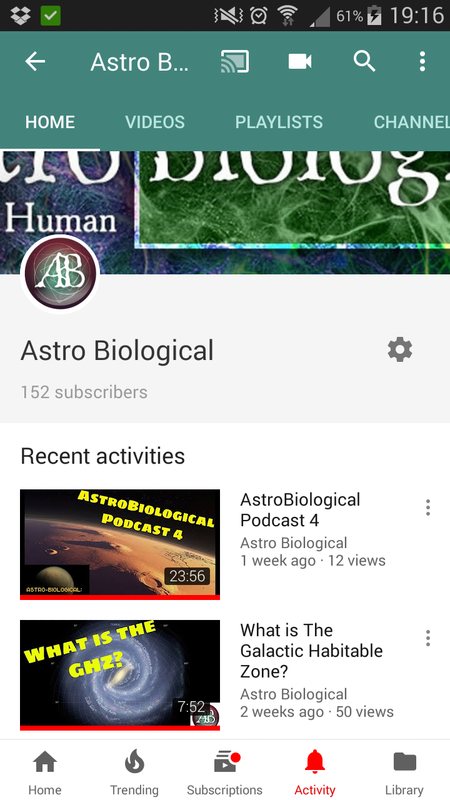 My channel is AstroBiological. I look at astrobiology. It’s a fun topic but a niche one. I do it right now because I like it. 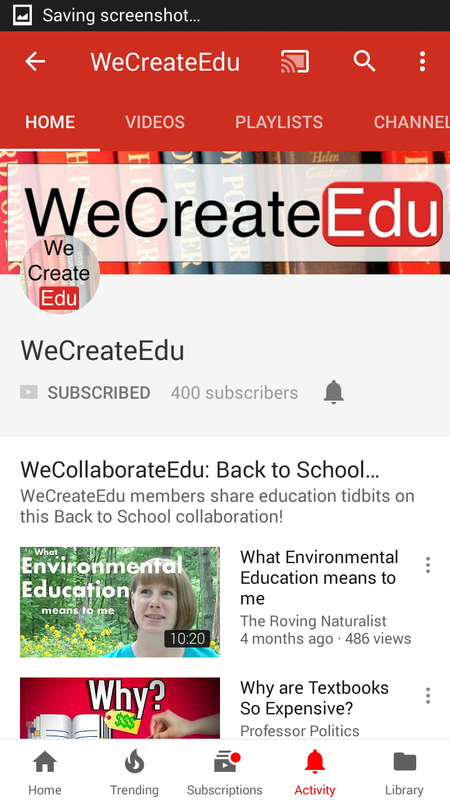 Other channels like mine deserve notice and so I implore the reader to peruse this catalogue of fine educational content, created by WeCreateEdu; a Slack.com group dedicated to giving educational YouTubers the help and resources they need to find their feet. I’m nowhere near there yet, but others are. There are plenty of good people in this list, and all some of them want is for you to watch and enjoy what they have really worked hard to create. It’s a labour of love for many, so there’s an extra sting when they go unnoticed. If you’re an educational YouTuber yourself, let’s all work together and help each other toward whatever dream motivates us. WeCreateEdu is a supportive community and I’ve learnt and lot. Maybe you can too! It’s a story that began 20000 years ago, and has been waiting for you. Like something out of a “Star Trek” episode. The vista before you hangs in the black like a portal into the fiery underbelly of all that’s good in the Universe. “Star Trek” You remember it now. The Battle of Wolf-359. It was a classic episode, in which a tattered human military force took on a vastly superior foe: the Borg. These creatures were bloodless and implacable. Truly unsettling bad guys. This monster is just as unsettling. Wolf-Rayet-124 is real. It’s huge. You’ve come a long way to encounter it. A small fleet of drone-sats has been dispatched to get up close and personal with this Wolf-Rayet star, to see how extreme extreme sports can get. As soon as humans got comfortable in space and started calling all kinds of dark corners and odd rocks home they were up to their usual mischief. As soon as all the laws were decreed and the soapboxes were all put away, humans got back to the serious business of finding new and bizarre ways to enjoy themselves. Space tourism didn’t become big business. It became exponentially big business. Extreme sports fans weren’t interested in scuba diving with great white sharks anymore, or parachuting. Ha! You recall the stories. The One-G-ers were those quaint old extreme sportsters who couldn’t let go of old mother earth. Most of them were toothless and half nuts decades ago, but they still harped on about climbing Mount Everest or wrestling crocodiles. You look upon Wolf-124, blazing with a luminosity several million times greater than Earths sun back home. Wolf-124 is huge. How huge? These kinds of stars are rare. Of the millions of stars known to humanity only around 500 Wolf-Rayet stars are known to exist in this galaxy. Wolf-Rayet stars are thought to be the powerhouses driving many planetary nebula or stellar nurseries. How does this work? Your little drone sats are tasting the cloud of ionised gas and interstellar gunk that swirls around the star. This cloud is nearly 6 light years across; a dusty miasma flung outwards by the intense solar winds radiating from the star within. From your vantage point out here, looking down into this slow maelstrom you see chunks of the star heading outward. Earth sized pieces of WR-124 soar through the cloud like the volcanic rage of a demon tearing itself apart. You write that last line down. The tourists will love it. Sometime around 20000 years ago, when human beings were first discovering Europe WR-124 began tearing itself apart. Scientists never really ascertained why, but it’s made for some great observations over the years. Tourists will love this. You got here first, to set up the first fleet of solar sailing yachts. The winds from the star crack along at 1600 km per second, fast enough to twist the most iron stomachs. These stars have unusual emission spectra. Many of the space tourists won’t care what this is, but there’s always someone in every group who just has to understand what they’re leaping into. Fair enough. What it means is that like any other star a Wolf-Rayet star burns up fuel. Our star, a relatively youthful star somewhere near middle age, is still burning hydrogen via the process of stellar fusion. As a star ages it’s supply of hydrogen becomes depleted, and it must burn heavier elements in order to survive.Wolf-Rayet stars are often seen to have high levels of quite heavy elements or “metals” such as carbon or nitrogen in their upper atmosphere. This is due to nearly complete depletion of hydrogen fuel so as a result heavier elements are being used up. What does this have to do with spectra? Well, as elements transition from higher to lower energy states, ie when they’re being burned up inside a star, photons of particular wavelenghts are given off. It’s possible to tell just by analysing the wavelengths of light radiating from a star (it’s emmision spectra) what’s going on in and immediately around the star. This is why scientists know WR stars are old, and what they’re burning off in place of hydrogen. It’s also the reason they can infer the presence of extreme solar winds. The luminosity and heat given off by a WR star is extreme. 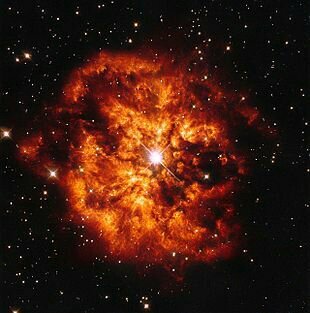 At it’s surface a WR star can reach temperatures of between 30000 and 200000 Kelvin; hotter by far than most other stars. 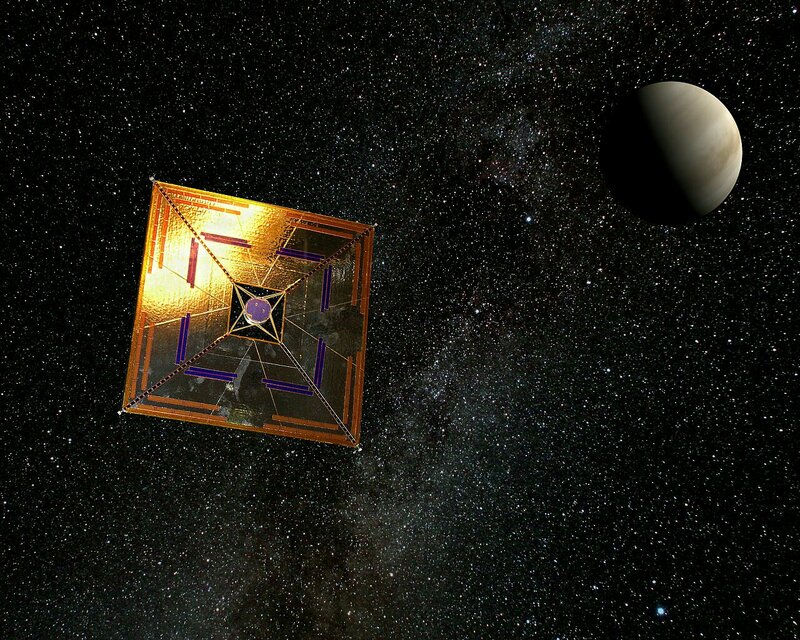 Such radiative pressure literally manifests as a “wind”, with the abilty to exert pressure on objects, such as solar sails! Most of the drone sats are keeping a safe distance from WR-124. This might just be an imaginary blog post, but you have imaginary operating costs, you know? So you’ve staked your claim here. Now, all that’s left to do is wait for the money to fly in! Still, you’re thinking of your next venture. There’s an exoplanet out there somewhere: HD 189733B where it rains glass! Now that sounds like fun….. While you’re here, join me on the AstroBiological YouTube channel. I’m hard at work sprucing it up. What do you think of this intro sequence? Small YouTube channels are feeling the squeeze from some draconian new measures by Google which effectively punish small creators and make it almost impossible to gain traction. Some thoughts on the matter from a fellow YouTuber. 2018 lies before me, and I can’t sleep. What do you do when you can’t sleep? You write a blog post. The last hour has been a blur, as I’ve tweeted, posted, video’ed, recorded and generally spread new year cheer across the social media sphere (or my own tiny little corner of it). 2017 was a pretty good year from my point of view, in terms of approaching a learning curve pretty well. My channel continues to be small, but it is growing. Twitter generally continues to be fun, although 2017 was marred by an ever encroaching tide of bile and craziness surging up from some plain divisive people. The solution to hearing things you don’t like? Block, block, block! Such a simple and elegant solution! Twitter was becoming out of hand, but in the last few months I’ve been steadily blocking folks from the more insane and divisive corners of society, and I’ve never looked back! My channel underwent a bit of rebranding a few months ago, and I’ve been happy with the result. After YouTube decided not to monetise tiny channels such as mine I realised that this gave me the freedom to do whatever I wanted, and to not worry so much about opinions. I mean, who’s watching and what do I have to lose? It’s actually helped me and my mindset toward the channel and the creative side of things. A facebook group I’ve started is doing well too. Membership is growing quickly, and it’s been a great way of meeting other science lovers. And there’s this little ol’ blog. Thank you very much to readers and those who have followed it. 2018 will be bigger and better, I promise!